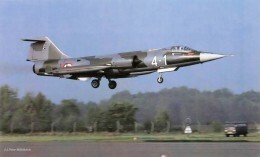 This month a squadron exchange took place between the German Navy MFG1 based at Schleswig Jagel flying the F-104G and the French Navy squadron 11F based at Landivisiau flying the Super Etendard. It was a one-way exchange where four German Starfighters flew to France. This month a squadron exchange took place between the Dutch Air Force 312 Squadron based at Volkel AB flying the F-104G and the Italian Air Force 21 Gruppo based at Cameri AB flying the F-104S. It was a two way exchange. Italian aircraft involved were MM6930/53-04, MM6737/53-11, MM6935/53-15 and MM6807/53-16. On the 23rd April the aircraft MM6881/53-12, MM6825/53-20 came along to see goodbye. Pre-exchange toke place on April 3rd by two Starfighters MM54260/20-25 and MM6737/53-11. 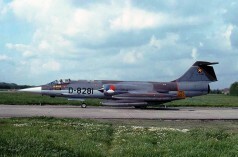 Dutch Starfighters which flew to Cameri were F-104G D-6668, D-6670, D-8245, D-8281. Aircraft D-6670 and D-8281 at least received some nice tiger paintings on the tiptank-tips as seen on the photo beneath. Also a photo of MM6881 code 53-12 taken at April 23rd in the poring rain by Traditiekamer Typhoon via Jeroen Jonkers. 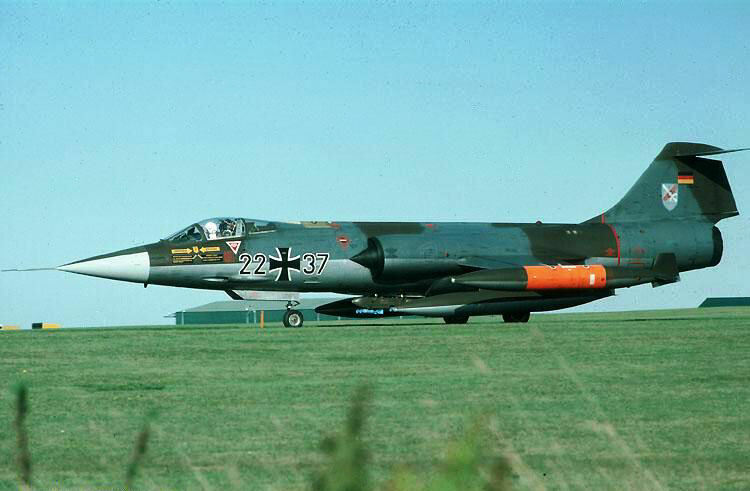 This month a squadron exchange took place between the German Navy MFG1 based at Schleswig Jagel flying the F-104G and the Canadian Armed Forces 441 Squadron within 1 CAG flying the CF-104. It was a shifted squadron exchange where eight (!!!!) 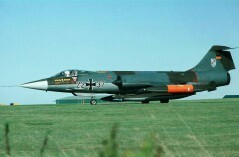 Canadian Starfighters flew to Schleswig Jagel. 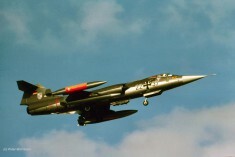 The 441 Squadron book stated the period ended on 4 May and they operated with six CF-104 and one CF-104D aircraft. 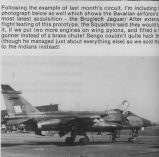 It was a shifted exchange since the MFG1 went to Baden Sollingen late September and stayed until early October with six F-104G Starfighters. 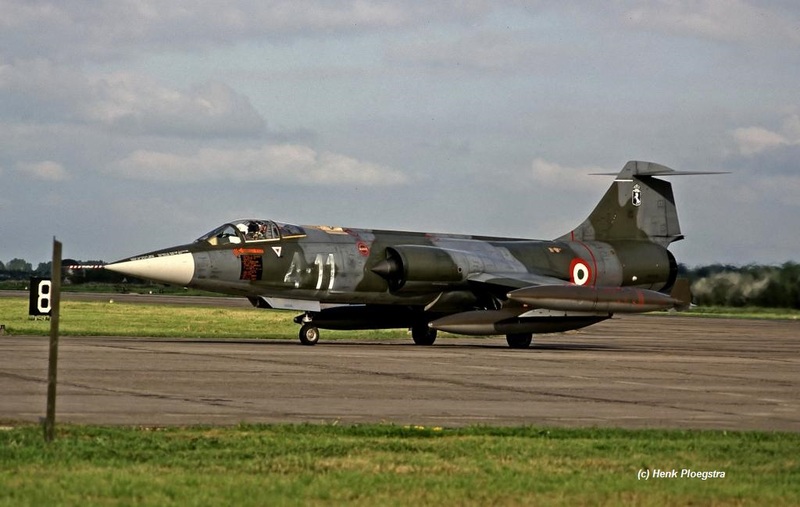 This month a squadron exchange took place between the French Air Force EC 1/3 and EC 2/3 both based at Nancy AB flying the Mirage IIIE and the Italian Air Force 154 Gruppo based at Ghedi AB flying the F-104G. It was a two way exchange. 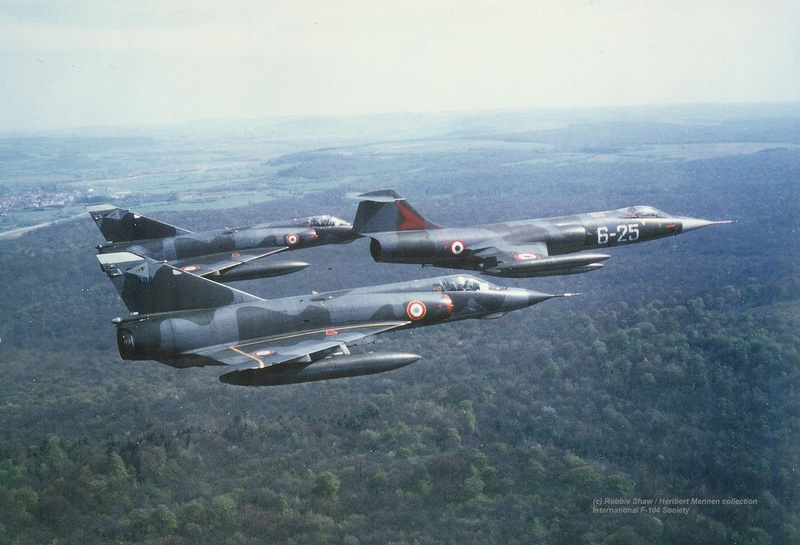 Starfighters seen in France were MM6532/6-03, MM6507/6-06 and MM6502/6-25. It is likely that a 4th aircraft was participating but could not be identified. 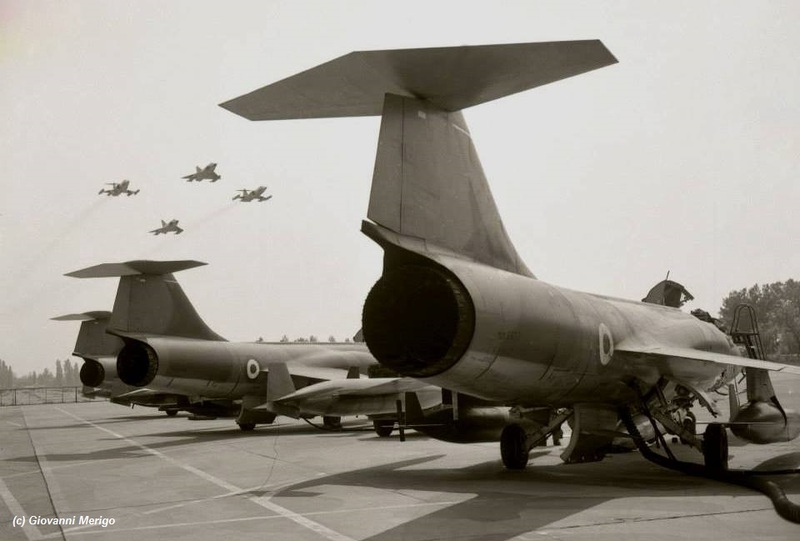 Photo beneath taken by Giovanni Merigo shows a flyover of Mirages and F-104s during the squadron exchange. The air-to-air photo taken over France shows aircraft 6-25, taken by Robbie Shaw. Both EC 1/3 and EC 2/3 were involved, with most probably EC 1/3 flying to Ghedi and 154 Gruppo was hosted by EC 2/3 at the Air Base of Nancy. This month a squadron exchange took place between the Dutch Air Force 311 Squadron based at Volkel AB flying the F-104G and the German Air Force JBG34 based at Memmingen AB flying also the F-104G. It was a 2-way exchange. German Starfighters seen at Volkel were: 20+05, 22+41, 22+44, 22+55 and 24+98. Pre-exchange was on April 19th by aircraft 22+61 and 27+22. 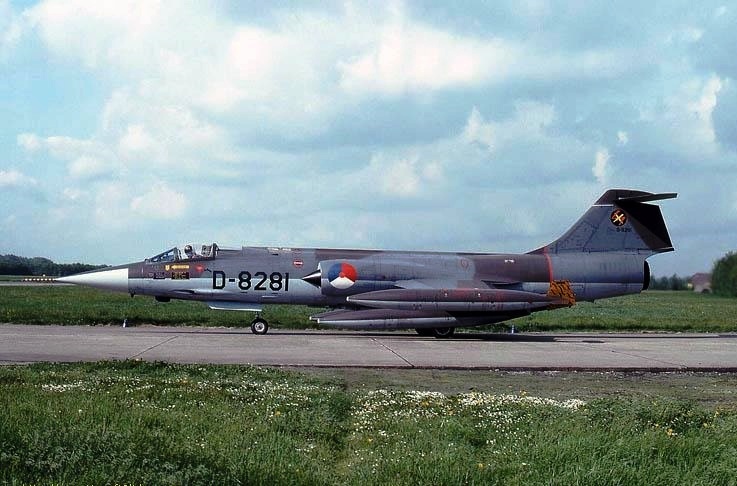 Dutch Starfighter which flew to Germany were D-6684, D-8022, D-8048, D-8266 and D-8300. 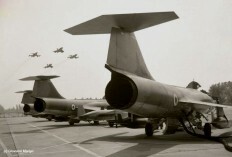 Beneath a photo by 311 Squadron archive showing the interesting line-up of JBG34 Starfighters at Volkel. This month a squadron exchange took place between the Royal Air Force 19 Squadron based at Wildenrath AB flying the Phantom FGR.2 and the Italian Air Force 10 Gruppo based at Grazzanise AB flying the F-104S. It is unknown if it was a 1 or a 2-way exchange where at least the Italians flew to Wildenrath, Germany. Aircraft involved were MM6768/9-30, MM6772/9-31, MM6878/9-40, MM6929/9-46. On 18 April 1979 the aircraft MM6941/9-32 and MM6878/9-40 made a pre-visit together with TF-104G MM54258/4-23, to discuss the squadron exchange. These three aircraft flew back on the 19th of April. Support during the exchange itself was flown by C-130H MM61992 code 46-06 and DC-6 MM61922 code 31-26. This month a squadron exchange took place between the Hellenic Air Force 349 Mira flying the RF-5A and the Italian Air Force 22 Gruppo, based at Istrana flying the F-104S. It is unknown if it was a 1 or a 2 way exchange but at least the RF-5A's flew to Italy. The Belgium Air Force 1 Wing - 349 Squadron operating the F-104G at Beauvechain, exchanged this month with the Portuguese Air force ESQ.201, operating the F-86F and T-38A at Monte Real. 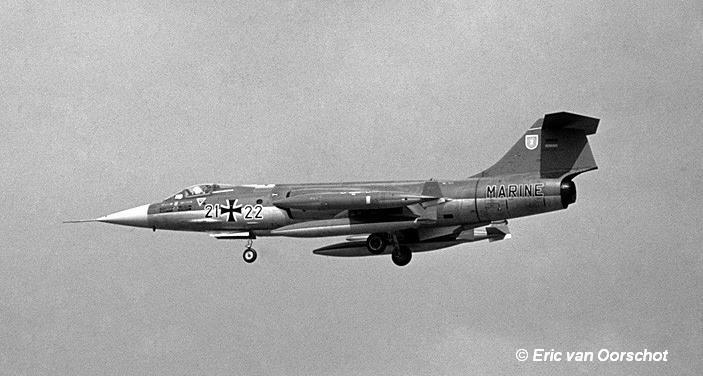 It is unknown if it was a 1 or a 2 way exchange but at least the F-104s flew to Portugal. This month a squadron exchange took place between the Royal Air Force 92 Squadron based at Wildenrath AB flying the Phantom FGR.2 and both Norwegian Air Force squadrons 331 and 334 Skv. flying the F-104G and CF-104. 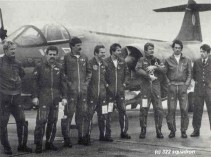 It was a 2-way shifted exchange where first 92 Squadron flew to Norway (exact date unknown) and later on June 5th Norwegian Starfighters flew to Germany. 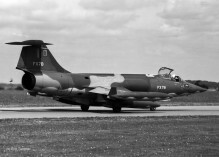 Aircraft seen at Wildenrath were: F-104Gs 232, 240, 631 and CF-104s 104717, 104755 and 104766. 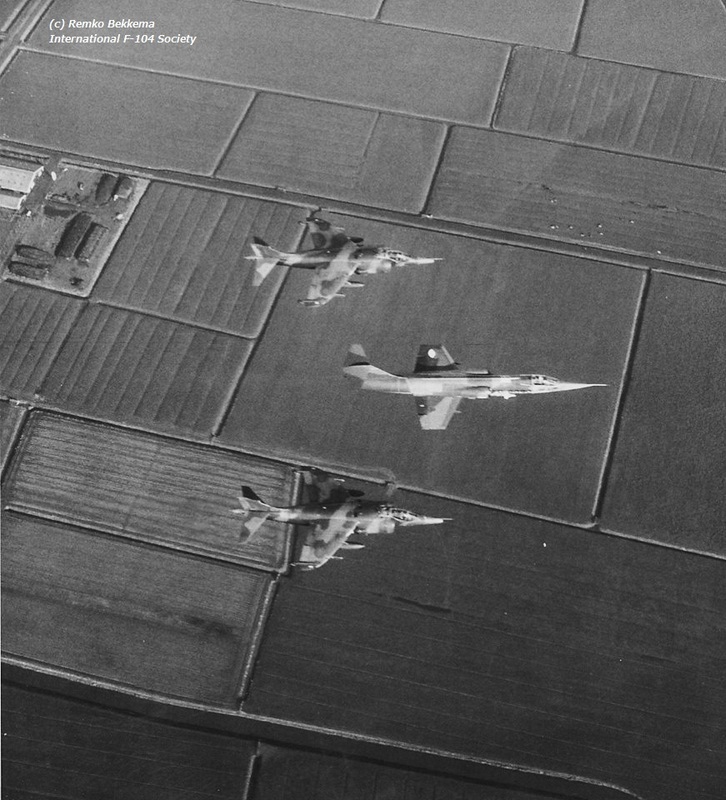 This month a squadron exchange took place between a German Navy MFG2 (staffel nr 1) flying the RF-104G and the also RF-104G operating Dutch Air Force 306 Squadron based at Volkel AB. It was a two-way exchange where five Dutch recce Starfighters flew to Germany and six German aircraft flew to Holland being 21+07, 21+15, 21+19, 21+22, 21+23 and 23+22 all RF-104Gs. 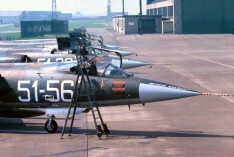 The five Dutch aircraft were D-8052, D-8059, D-8107, D-8125 and D-8145. Photo taken by Eric van Oorschot beneath shows F-104G 21+22 from MFG2 landing at Volkel. 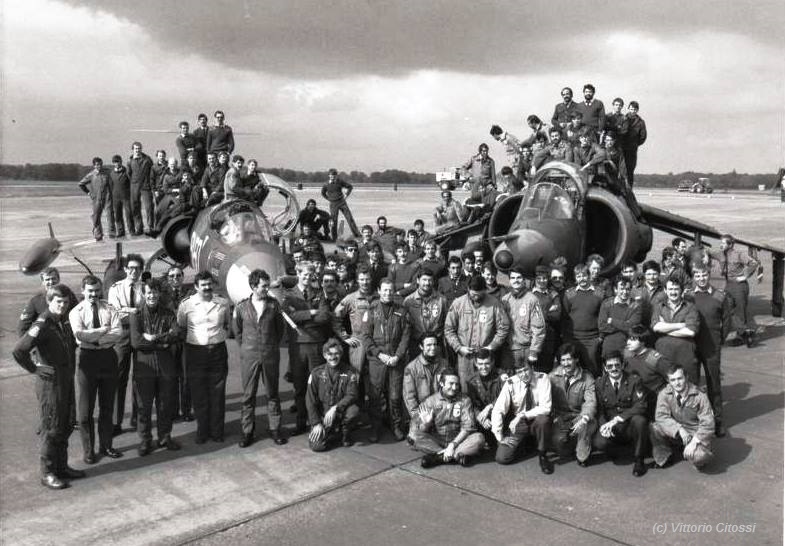 This month a squadron exchange took place between the Royal Air Force 20 Squadron, based at Bruggen, Germany, flying the Jaguar GR.1, and Italian Air Force 102 Gruppo based at Rimini flying the F-104S. It was a one-way exchange. Only the Jaguars flew to Italy. 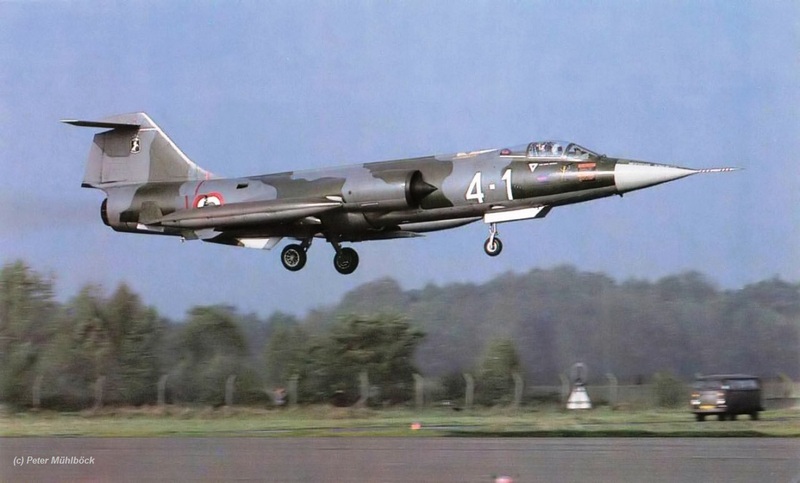 This month a squadron exchange took place between the German Navy MFG1 based at Schleswig Jagel flying the F-104G and the French Navy squadron 11F based at Landivisiau flying the Super Etendard. 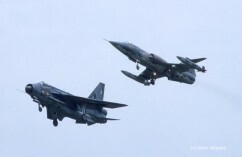 It was a one-way exchange where four Super Etendards flew to Germany. It looks like a follow up exchange after the 1-way exchange in March 1979. In June and August this year a shifted squadron exchange took place between the Canadian Air Force 421 Squadron based at Sollingen AB flying the CF-104 and the Royal Netherlands Air Force 314 Squadron based at Eindhoven AB flying the Northrop NF-5. First the Dutch aircraft flew to Germany in June and in August the Canadians came to Eindhoven for their shift. 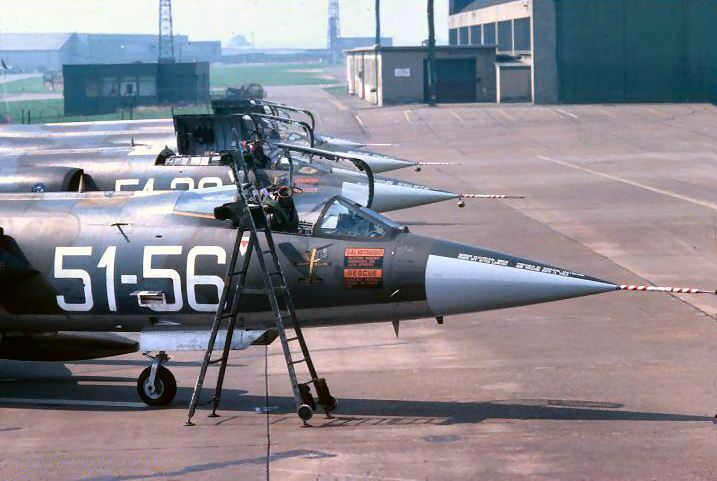 Aircraft seen at Eindhoven included CF-104s 104733 and 104807 (as can be seen beneath thanks to Frank Swinkels). Interesting to see the 441 Squadron markings on its tail. This month a squadron exchange took place between the Royal Air Force 1 Squadron based at Wittering AB flying the Hawker Harrier GR.3 and the Italian Air Force 155 Gruppo based at Istrana flying the F-104S. It is unknown if it was a 1 or 2 way exchange but at least four Starfighters flew to Wittering. Aircraft seen were MM6837/51-32, MM6839/51-50, MM6844/51-56 and MM6945/51-37. Beneath a photo taken at Wittering showing a line up of Starfighters on the flightline and a nice group photo provided by Vittorio Citossi taken also at Wittering. 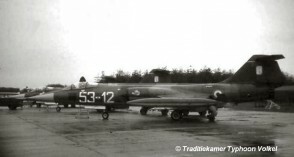 This period a squadron exchange took place between the German Air Force training squadron WS10 (1st Staffel) based at Jever AB flying the F and TF-104G, and the Italian Air Force 23 Gruppo based at Rimini flying the F-104S. It is unknown if it was a 1 or 2 way exchange but at least four Italian Starfighters flew to Germany and flew back via Norvenich AB. The aircraft were MM6782/5-03, MM6925/5-30, MM6?? ?/5-34 and MM6928/5-36. 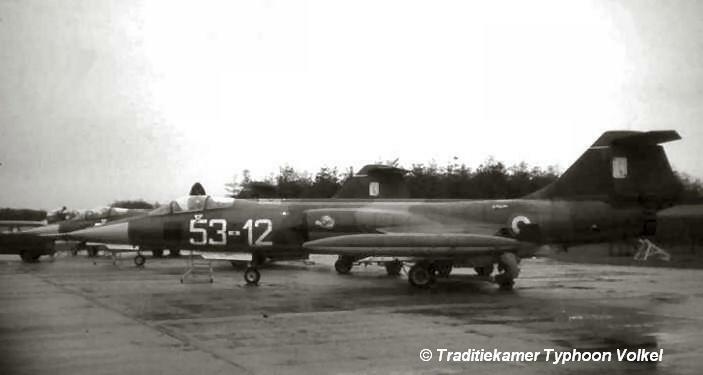 This period a squadron exchange took place between the Dutch Air Force composite 645 Squadron (322 + 323 Squadron) at Leeuwarden AB flying the F-104G and the Italian Air Force 9 Gruppo based at Grosseto AB flying the F-104S. It was a 2 way exchange. Italian Starfighters seen at Leeuwarden were MM6819/4-11, MM6822/4-1, MM6869/4-3 and MM6936/4-6. All aircraft flew via Bitburg (fuelstop). the 6 Dutch Starfighters seen in Grosseto were D-6653, D-8082, D-8093, D-8109, D-8115 and D-8319. It is very likely that a pre-visit took place on April 24th since that day TF-104G MM54251/20-15 and the two F-104S MM6739/4-10 and MM6869/4-3 were seen at Volkel Air Base for a fuel stop. However we still need some confirmation that indeed these aircraft visited Leeuwarden that day. Beneath some photo taken of MM6819 (Henk Ploegstra), MM6822 (Peter Mühlböck) and MM6836 (Henk Ploegstra). 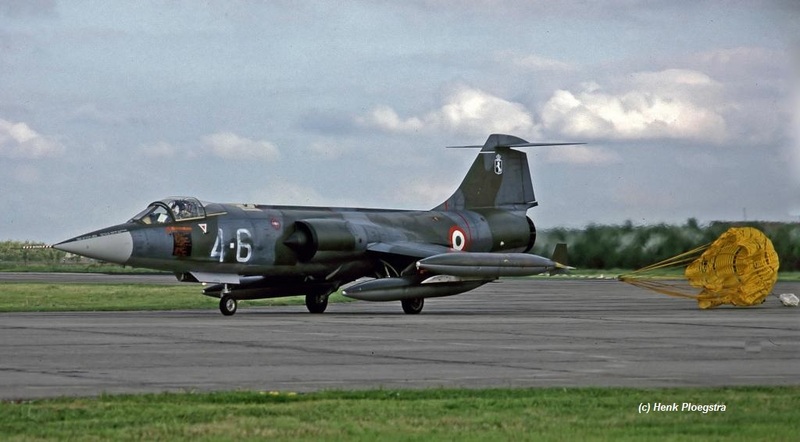 This month a squadron exchange took place between the Danish Air Force 723 ESK based at Aalborg flying the F-104G and the RAF 29 squadron based at Coningsby flying the Phantom FGR.2. It's unknown if this was a one or two-way exchange but at least Danish Starfighters were seen in the UK. On September 10th, Danish aircraft R-699 and R-753 were both seen. This month a squadron exchange took place between the German Navy MFG1 based at Schleswig Jagel flying the F-104G and the Canadian Armed Forces 441 Squadron within 1CAG based at Baden Sollingen flying the CF-104. 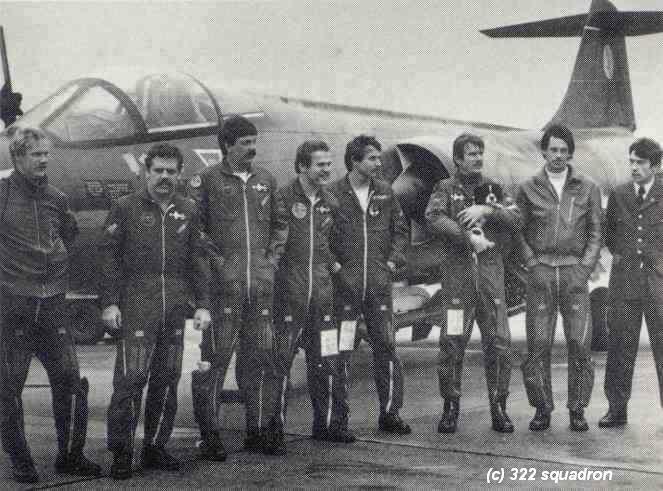 Six Starfighters flew to Germany for their shift in this shifted squadron exchange after the Canadians were at Schlesswig already in April/May 1979. 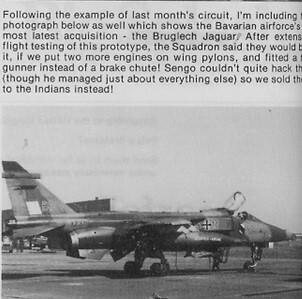 In 1979 there was a one-way squadron exchange between the German Air Force JBG32 based at Lechfeld, flying the F-104G and the Royal Air Force 17 Squadron flying the Sepecat Jaguar GR.1 aircraft at Bruggen, Germany. Only Jaguar aircraft visited Lechfeld from July 30th till August 8th. These aircraft were given JBG32 squadron markings. However Jaguar XX371/BP received full German markings at Lechfeld. On the left intake "17+32" (17sq/JBG32) and "32+17" on starboard intake and also JBG32 badges + County flags were added. (see beneath short article published inside Station Magazin" Bruggen Circuit" and nice drawing thanks to Michel Debarre ). This was not quite accepted by the squadron so the aircraft was flown back to Bruggen immediately and cleaned after landing on August 6th. It was a one-way exchange but to "remember or celebrate" this exchange, four JBG32 aircraft payed a visit to Bruggen lateron in September for a weekend (7 till 10th September) being 20+68, 24+12, 25+26 and 25+49. Also a DO-28 flew with them. Information thanks to Hans-Jürgen Breuer. Note: This was from JBG32 not a real exchange but more a spin-off from the one-way exchange by 17 squadron. 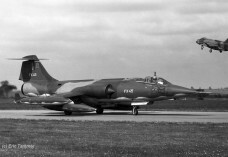 This month there was a exchange between the German Air Force JBG31 (2nd Staffel) based at Norvenich AB, flying the F-104G and the Royal Air Force 12 Squadron based at Honington AB flying the Buccaneer S.2B. It was a 2 way exchange where six Starfighters (20+39, 22+37, 23+99, 24+02, 26+25 and 27+84) flew to Honington. Four Buccaneer S2B flew to Nörvenich (XN976, XV868, XX896, XX898) with support by XV191 and XV201 (C-130K Hercules Lynham). Photos of aircraft 22+37 can be seen beneath (Peter Mühlböck collection). 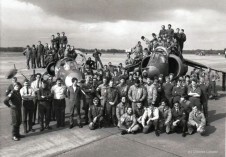 This period a squadron exchange took place between the Royal Air Force 14 Squadron based at Bruggen flying the Sepecat Jaguar GR.1 and the Italian Air Force 156 Gruppo based at Gioia del Colle flying the F-104S. It was a two way exchange. Italian Starfighters seen at Bruggen were MM6817/36-11, MM6915/36-41, MM6909/36-51 and MM6838/36-55. Pre-visit took place by MM6774/36-03 and MM6926/36-12 (both with 12 Gruppo markings!) arriving September 27th and returning back to Italy the next day. Transport during the exchange was performed by RAF C-130s XV193 and XV305. Information thanks to Hans-Jürgen Breuer. 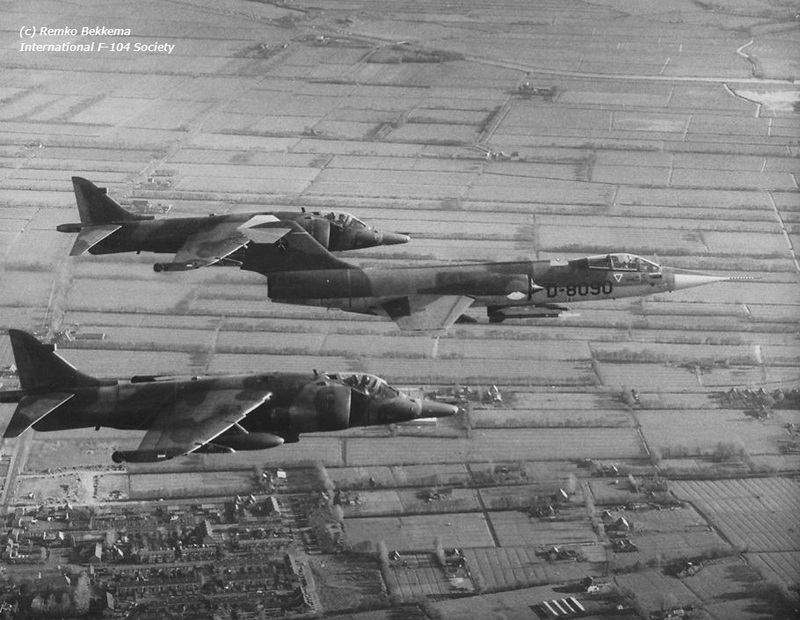 This month a squadron exchange took place between the Royal Air Force 4 Squadron based at Gutersloh AB flying the Hawker Harrier GR.3 and the Dutch Air Force composite 645 Squadron (322 + 323 Squadron) based at Leeuwarden AB flying the F-104G. 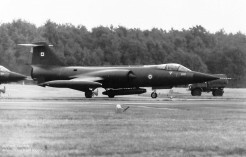 It was a 2 way exchange where 4 Harriers came to Leeuwarden AB and six Starfighters flew to Gutersloh. 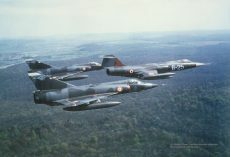 Starfighters which flew to Gutersloh were TF-104G D-5809 and F-104G D-8058, D-8060, D-8083, D-8304 and D-6653. The D-8058 returned to Leeuwarden earlier. Photos (thanks to 322 Squadron) show left the RAF delegation at Leeuwarden and right the 104 pilots at Gutersloh, from left to right Reinout de Lange, Guy Putker, Rob Schuyt, Leo van den Born, Nico Dijxhoorn, Peter Schmidt, Ary van der Stel and Henk van Berkum. 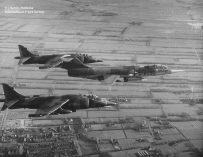 Also two photos which have been taken over the Dutch landscape near Leeuwarden Air Base showing a nice mixed formation. (photos thanks to Remko Bekkema). This year a squadron exchange took place between the Hellenic Air Force 348 Mira based at Larissa AB, flying a mix of RF-84F Thunderflash and RF-4E Phantom aircraft, and the Italian Air Force 28 Gruppo, based at Villafranca flying the F-104G. It is unknown if it was a 1 or a 2 way exchange. 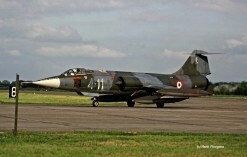 This year a squadron exchange took place between the Belgium Air Force 42 Escadrille based at Florennes AB flying the Mirage 5BR and the Italian Air Force 102 Gruppo, based at Rimini flying the F-104S. It is unknown if it was a 1 or a 2 way exchange.